The latest in the phoniness.. is the BUSINESS MESSENGER. They are going so far as to fake the sign on, the "activation" and the actual product in action. Take a look for yourself. I mean if Microsoft were halfway intelligent, they would pick these people up and put them to work in the design department. They definitely have talent, but are channeling it in the wrong direction. 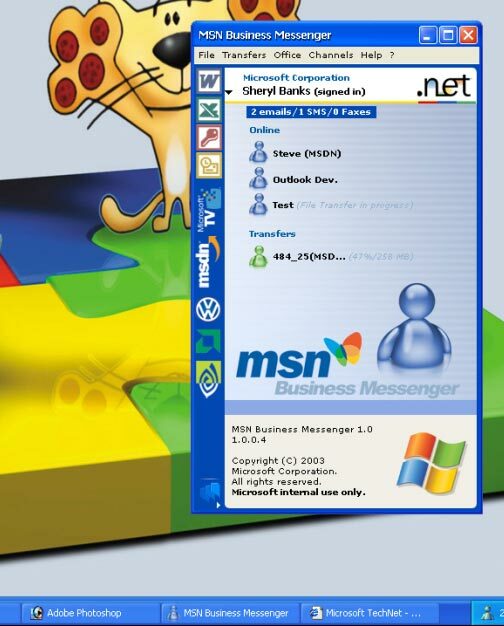 Nicholas sent me a screenshot http://www.mess.be/msnbusinessmessenger.jpg of MSN Business Messenger 1.0. Notice the SMS and fax notification, extra transfer status (sending a 258mb file through MSN!) and MS Office integration. By the look of it, this fancy enterprise IM client will be released in 2003. Adobe Photoshop running in the background makes me a little bit suspicious about the validity of this screenshot.